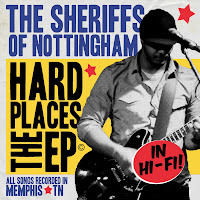 A while back, I came across Memphis based The Sheriffs of Nottingham on Twitter, I th ink. I can't remember if they found me or I found them but we're now doing the mutual follow thing. It doesn't really matter who found whom, does it? At any rate, I gave them a listen and liked what I heard. I made an inquiry about whether they had a record out and they kindly responded that they would have one out in October or November. Well, it's October and true to their word, there is a record! The record, by the way is titled Hard Places: The EP and it's a solid piece of rock 'n' roll. The Sheriffs of Nottingham consists of Justin Jamerson (vocals, rhythm guitar), Kevin Lipe (lead guitar), Curry Smith (bass, vocals) and Kyle Fagala (drums). They have this whole funky, soulful, blues rock thing going on. Hey now! Y'all know I like that kind of stuff. The EP kicks off with "Running Man." The music reminds me of some funkified Led Zeppelin. As I continued to listen, I kept thinking they reminded me of another band that had the same sort of vibe, the now defunct Brand New Immortals to be specific. Not remind in a, they're ripping them off sort of way or anything but, remind as in it's a familiar and comfortable sound that I enjoy having in my collection. Anyway, this record has been in frequent rotation on my iPod since I picked it up. Check 'em out for yourselves. You can stream and or buy Hard Places: The EP using the handy widget below. Well Hot Damn, Bob Schneider On DVD! El Perro Del Mar - "Change Of Heart"
Video: Jet - "Black Hearts (On Fire)"
Happy Birthday Quirky NY Chick!